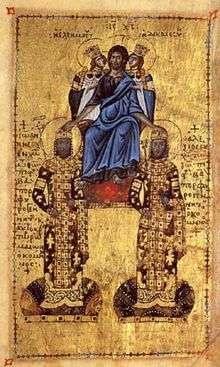 John II Komnenos or Comnenus (Greek: Ίωάννης Βʹ Κομνηνός, Iōannēs II Komnēnos; September 13, 1087 – 8 April 1143) was Byzantine Emperor from 1118 to 1143. Also known as "John the Beautiful" or "John the Good" (Kaloïōannēs), he was the eldest son of Emperor Alexios I Komnenos and Irene Doukaina and the second emperor to rule during the Komnenian restoration of the Byzantine Empire. John was a pious and dedicated monarch who was determined to undo the damage his empire had suffered following the battle of Manzikert, half a century earlier. The Latin historian William of Tyre described John as short and unusually ugly, with eyes, hair and complexion so dark he was known as 'the Moor'. Yet despite his physical appearance, John was known as Kaloïōannēs, "John the Good" or "John the Beautiful". The epithet referred not to his body but to his character. Both his parents had been unusually pious and John surpassed them. Members of his court were expected to restrict their conversation to serious subjects only. The food served at the emperor's table was very frugal and John lectured courtiers who lived in excessive luxury. His speech was dignified, but he engaged in repartee on occasion and his seriousness did not exclude a sense of humour. As a father he was affectionate, though he demanded high standards from his children, and he was a faithful husband to his wife. Despite his personal austerity, John had a high conception of the imperial role and would appear in full ceremonial splendour when this was advantageous. He was highly respected and honoured by his subjects. John was famed for his piety and his remarkably mild and just reign. He is an exceptional example of a moral ruler, at a time when cruelty was the norm. He is reputed never to have condemned anyone to death or mutilation. Charity was dispensed lavishly. For this reason, he has been called the Byzantine Marcus Aurelius. By the example of his personal purity and piety he effected a notable improvement in the manners of his age. Descriptions of him and his actions indicate that he had great self-control and personal courage, was an excellent strategist and an expert imperator in the field, and through his many campaigns he devoted himself to the preservation of his empire. 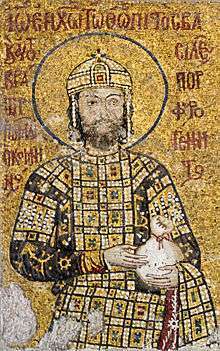 John II succeeded his father as ruling basileus in 1118, but had already been proclaimed co-emperor by Alexios I on September 1, 1092. Niketas Choniates alone tells of the actions by which John II secured his own accession to power. 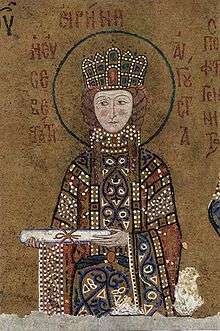 Alexios I had favoured John to succeed him over his wife Irene's favourite, the Caesar Nikephoros Bryennios, who was married to their daughter Anna Komnena. Alexios resorted to dissimulation in order to avert Irene's criticism of his choice and her demands that Nikephoros should succeed. 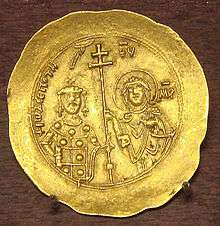 As Alexios lay on his deathbed in the monastery of the Mangana on 15 August 1118, John, consorting with relatives whom he could trust, among whom was his brother, the sebastokratōr Isaac Komnenos, stole into the monastery and took the imperial signet ring from his dying father. Then, taking up arms, he rode to the Great Palace, gathering the support of the citizenry who acclaimed him emperor. Irene was taken by surprise and was unable either to persuade her son to desist, or to induce Nikephoros to act against him. Although the palace guard at first refused to admit John without proof of his father's wishes, the mob surrounding the new emperor simply forced entry. Alexios died the following night. John refused to join the funeral procession, in spite of his mother's urging, because his hold on power was so tenuous. However, in the space of a few days, his position seemed secure. Within a year of his accession, however, John II uncovered a conspiracy to overthrow him which implicated his mother and sister. Anna's husband Nikephoros had little sympathy with her ambitions, and it was his lack of support which doomed the conspiracy. Anna was stripped of her property, which was offered to the emperor's friend John Axouch. Axouch wisely declined and his influence ensured that Anna's property was eventually returned to her and that John II and his sister became reconciled, at least to a degree. Irene retired to a monastery and Anna seems to have been effectively removed from public life, taking up the less active occupation of historian. However, Nikephoros remained on good terms with his brother-in-law. 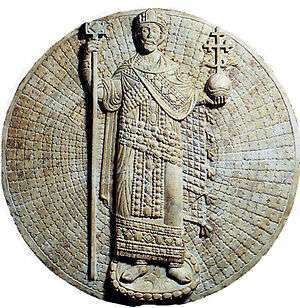 To safeguard his own succession, John crowned his young son Alexios co-emperor in 1122. The family intrigues that challenged his succession to the throne probably contributed to John's approach to rulership, which was to appoint men from outside the imperial family to help him govern the empire. This was a radical departure from the methods of his father, who had used the imperial family and its many connections to fill almost all senior administrative and military posts. The emperor had complete confidence in his appointees, many of whom had been chosen on merit rather than their connection to the imperial family and related aristocratic clans. John's unwillingness to allow his family to influence his government to any great extent was to remain constant for the rest of his reign. John appointed a number of his father's personal retainers to high office, men such as Eustathios Kamytzes, Michaelitzes Styppeiotes and George Dekanos. These were men who had been politically eclipsed during the ascendancy exercised by John's mother in the later years of the reign of Alexios I. A number of 'new men' were raised to prominence by John II, these included Gregory Taronites, Manuel Anemas and Theodore Vatatzes, the latter two also became his sons-in-law. After his accession, John II had refused to confirm his father's 1082 treaty with the Republic of Venice, which had given the Italian republic unique and generous trading rights within the Byzantine Empire. Yet the change in policy was not motivated by financial concerns. An incident involving the abuse of a member of the imperial family by Venetians led to a dangerous conflict, especially as Byzantium had depended on Venice for its naval strength. After a Byzantine retaliatory attack on Kerkyra, John exiled the Venetian merchants from Constantinople. But this produced further retaliation, and a Venetian fleet of 72 ships plundered Rhodes, Chios, Samos, Lesbos, Andros and captured Kefalonia in the Ionian Sea. Eventually John was forced to come to terms; the war was costing him more than it was worth, and he was not prepared to transfer funds from the imperial land forces to the navy for the construction of new ships. 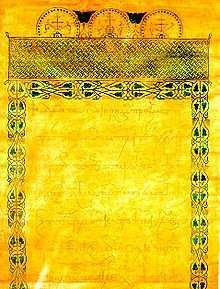 John re-confirmed the treaty of 1082. Nevertheless, this embarrassment was not entirely forgotten, and it seems likely that it played a part in inspiring John's successor (Manuel I Komnenos) to re-establish a powerful Byzantine fleet some years later. John's marriage to the Hungarian princess Piroska involved him in the dynastic struggles of the Kingdom of Hungary. In giving asylum to Álmos, a blinded claimant to the Hungarian throne, John aroused the suspicion of the Hungarians. The Hungarians, led by Stephen II, then invaded Byzantium's Balkan provinces in 1127, with hostilities lasting until 1129; however, an alternative chronology has been suggested with the Hungarian attack and Byzantine retaliation taking place in 1125 with a renewal of hostilities in 1126. John launched a punitive raid against the Serbs, who had dangerously aligned themselves with Hungary, many of whom were rounded up and transported to Nicomedia in Asia Minor to serve as military colonists. This was done partly to cow the Serbs into submission (Serbia was, at least nominally, a Byzantine protectorate), and partly to strengthen the Byzantine frontier in the east against the Turks. The Serbs were forced to acknowledge Byzantine suzerainty once again. The Serbian campaign may have taken place between two distinct phases in the war against Hungary. The Hungarians attacked Belgrade, Nish and Sofia; John, who was near Philippopolis in Thrace, counterattacked, supported by a naval flotilla operating on the Danube. After a challenging campaign, the details of which are obscure, the emperor managed to defeat the Hungarians and their Serbian allies at the fortress of Haram or Chramon, which is the modern Nova Palanka; many Hungarian troops were killed when a bridge they were crossing collapsed as they were fleeing from a Byzantine attack. Following this the Hungarians renewed hostilities by attacking Braničevo, which was immediately rebuilt by John. Further Byzantine military successes, Choniates mentions several engagements, resulted in a restoration of peace. The Byzantines were confirmed in their control of Braničevo, Belgrade and Zemun and they also recovered the region of Sirmium (called Frangochorion in Choniates), which had been Hungarian since the 1060s. The Hungarian pretender Álmos died in 1129, removing the major source of friction. Early in John's reign the Turks were pressing forward against the Byzantine frontier in western Asia Minor, and he was determined to drive them back. In 1119, the Seljuqs had cut the land route to the city of Attaleia on the southern coast of Anatolia. John II and Axouch the Grand Domestic recaptured Laodicea and Sozopolis, re-opening land communication with Attaleia. This route was especially important as it also led to Cilicia and the Crusader states of Syria. Following the end of hostilities with Hungary, John was able to concentrate on Asia Minor during most of his remaining years. He undertook a campaign against the Danishmendid emirate in Malatya on the upper Euphrates from 1130 to 1135. Thanks to his energetic campaigning, Turkish attempts at expansion in Asia Minor were halted, and John prepared to take the fight to the enemy. 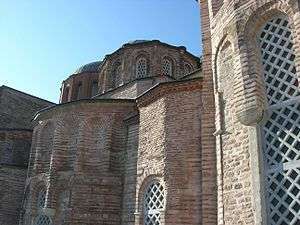 In order to restore the region to Byzantine control, he led a series of well planned and executed campaigns against the Turks, one of which resulted in the reconquest of the ancestral home of the Komnenoi at Kastamonu (Kastra Komnenon); he then left a garrison of 2,000 men at Gangra. John quickly earned a formidable reputation as a wall-breaker, taking one stronghold after another from his enemies. Regions that had been lost to the empire since the Battle of Manzikert were recovered and garrisoned. Yet resistance, particularly from the Danishmends of the northeast, was strong, and the difficult nature of holding the new conquests is illustrated by the fact that Kastamonu was recaptured by the Turks even as John was in Constantinople celebrating its return to Byzantine rule. John persevered, however, and Kastamonu soon changed hands once more. In the Levant, the emperor sought to re-inforce Byzantine claims to suzerainty over the Crusader States and to assert his rights over Antioch. In 1137 he conquered Tarsus, Adana, and Mopsuestia from the Principality of Armenian Cilicia, and in 1138 Prince Levon I of Armenia and most of his family were brought as captives to Constantinople. This opened the route to the Principality of Antioch, where Raymond of Poitiers, Prince of Antioch, and Joscelin II, Count of Edessa, recognized themselves as vassals of the emperor in 1137. Even Raymond II, the Count of Tripoli, hastened northwards to pay homage to John, repeating the homage that his predecessor had given John's father in 1109. There then followed a joint campaign as John led the armies of Byzantium, Antioch, and Edessa against Muslim Syria. Aleppo proved too strong to attack, but the fortresses of Balat, Biza'a, Athereb, Maarat al-Numan, and Kafartab were taken by assault. Although John fought hard for the Christian cause in the campaign in Syria, his allies Prince Raymond of Antioch and Count Joscelin II of Edessa sat around playing dice instead of helping John to press the Siege of Shaizar. The Crusader Princes were suspicious of each other and of John, and neither wanted the other to gain from participating in the campaign. Raymond also wanted to hold on to Antioch, which he had agreed to hand over to John if the campaign was successful in capturing Aleppo, Shaizar, Homs, and Hama. 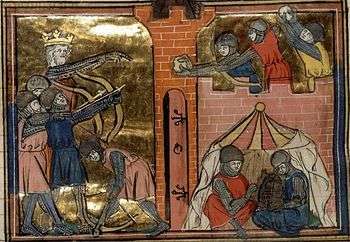 Latin and Muslim sources describe John's energy and personal courage in prosecuting the siege. The city was taken, but the citadel defied assault. The Emir of Shaizar offered to pay a large indemnity, become John's vassal, and pay yearly tribute. John had lost all confidence in his allies, and a Muslim army under Zengi was approaching to try to relieve the city, therefore the emperor reluctantly accepted the offer. The emperor was distracted by a Seljuq raid on Cilicia and developments in the west, where he was pursuing a German alliance directed against the threat posed by the Normans of Sicily. Joscelin and Raymond conspired to delay the promised handover of Antioch's citadel to the emperor, stirring up popular unrest in the city directed at John and the local Greek community. John had little choice but to leave Syria with his ambitions only partially realised. Having prepared his army for a renewed attack on Antioch, John amused himself by hunting wild boar on Mount Taurus in Cilicia, where, on April 8, 1143, he accidentally cut himself on the hand with a poisoned arrow. John initially ignored the wound and it became infected. He died a number of days after the accident, probably of septicaemia. It has been suggested that John was assassinated by a conspiracy within the units of his army of Latin origins who were unhappy at fighting their co-religionists of Antioch, and who wanted to place his pro-western son Manuel on the throne. However, there is very little overt support for this hypothesis in the primary sources. John's final action as emperor was to choose Manuel, the younger of his surviving sons, to be his successor. John is recorded as citing two main reasons for choosing Manuel over his older brother Isaac: Isaac's irascibility, and the courage that Manuel had shown on campaign at Neocaesareia. Another theory alleges that the reason for this choice was the AIMA prophecy, which foretold that John's successor should be one whose name began with an "M". Fittingly, John's close friend John Axouch, although he is recorded as having tried hard to persuade the dying emperor that Isaac was the better candidate to succeed, was instrumental in ensuring that Manuel's assumption of power was free from any overt opposition. The Byzantine empire under John II Komnenos, c. 1143. 16. Isaac, strategos of Thrace? Kinnamos, John (John Cinnamus), Deeds of John and Manuel Comnenus, trans. Charles M. Brand. Columbia University Press, 1976. Magdalino, Paul The Empire of Manuel I Komnenos 1143–1180, Cambridge University Press, 1993. ↑ John II, The World-wide Encyclopedia and Gazetteer, Vol. V, Ed. William Harrison De Puy, (The Christian Herald, 1908), 3654. ↑ Note:The primary sources, Kinnamos and Choniates, give little detail about this campaign, no dates are specified, and what they do say differs considerably. The chronology presented here, 1127-1129, follows that of Angold and other scholars, Fine has the events taking place earlier, in 1125-1126. ↑ Holt, Lambton & Lewis 1995, p. 240. ↑ Two rather ambiguous Byzantine rhetorical allusions were the basis of this theory – all contemporary historical writing unanimously agrees on an accidental cause for the death of John II.